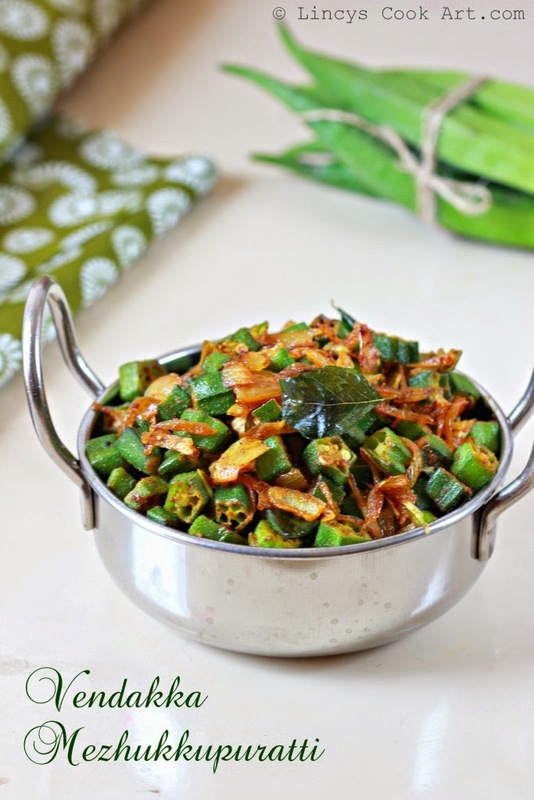 Vendakka Mezhukkupuratti is an easy to make stir fry. It is a healthy stir fry as this recipes has no coconut in it. Perfect dish to try when you are running out of time. Or you need a dry dish to carry when you travel. So simple to make but tasty dish. Try this dish at your home, you start to love this dish. The high light is in this recipe the bhendi is no more slimy. You can eat this stirfry as such. I love this preparation equally to vendakka thoran. Check out my othter Vendakka preparations like Vendakka Avial, Vendakka Pachadi/ Kichadi, Vendakka Theeyal. Chop the ladies finger into half inch pieces. Heat oil in a pan and add the chopped onion and curry leaves. Cook till the onions starts to become translucent for about a minute or two. Add the chopped Bhendi and salt; saute in that oil till the cut edges starts to brown and the Bhendi starts to shrink. Add turmeric powder, chilli powder and pepper powder and mix well. If you wish you can add some coriander powder too. Mix well and allow to coat the masala well in bhendi. Cook for about two minutes and turn off the gas before the bhendi's green colour turns to dull colour. Looks yumm dear. Perfect side dish..
delicious stir fry and very inviting clicks!!! Easy to make and tasty too!